The MAGIC Foundation is a charitable non-profit organization created to provide support services for the families of children afflicted with a wide variety of chronic and/or critical disorders, syndromes and diseases that affect a child’s growth. Our commitment and vision is, to reduce the emotional and physical trauma caused by growth disorders, resulting in healthier, happier children and consequently, adults. Our Motto: Children have a short time to grow and a lifetime to live with the results! If you have any questions, please contact us! To email Nathalie or Nick; send an email to ContactUs@magicfoundation.org and put CANADA in the Subject line. Join other Canadians on MAGIC Facebook! Please note- (non-business) Facebook pages are private. They are free for you to join, but do require your joining the specific group to minimize spammers. Once you apply to the Facebook groups, keep an eye on your "OTHER" Facebook message box and respond to that message so that we can verify who you are. We are very careful to protect you and your family. If you do not respond to that message, we will not allow you in. If you experience problems, email teresa@magicfoundation.org. MAGIC Foundation Canada does not provide names of physicians for referrals. MAGIC Foundation Canada does not provide funding for medications. Patients and their families should turn to Provincial Health Insurance plans and/or private insurance coverage. We are not Medical Doctors & cannot give medical advice, nor should any information provided be construed as such. Always consult your medical professional before making any decisions or taking any actions regarding you, or your family's health. 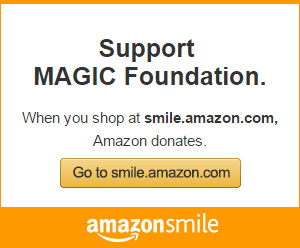 No advertisements for other charities will be permitted on the Facebook pages of MAGIC Foundation Canada.